Continuing the bala theme , I am returning to an artist of whom I have already posted two cassette (here and here). Molobaly Keita appears to have been at the basis of a new phenomenon in Malian youth culture, and more particularly - and more remarkably - urban youth culture. In the villages of Mali (especially in the southern part of the country) balafon groups have been entertaining children and women for ages. These groups, usually of musicians who also play in larger ensemble at ceremonies and festivities, perform in the street or on any 'square' or opening in the village. Parties like these are part of passing on the culture, and for the children an occasion to practice - or even compete on - their dancing skills. Over the last ten years, these bala parties have moved to the city. They have taken the place of the Sabar dancing parties or "Sabarni", which for their increasingly indecent and immoral character were banned from the streets of Bamako in the early years of this century. Apparently female dancers were showing off more thigh and behind than the public morals deemed respectable. The "Balani* show" street parties took their place in the teenage culture of Bamako. As the word suggests, the key instrument in these parties was the balafon. 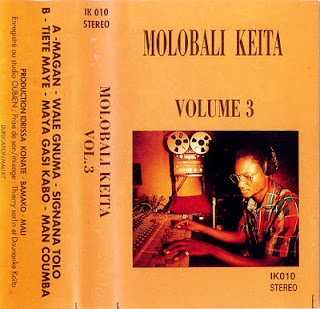 Personally I think the music of (artists like) Molobaly Keita must have played an essential role in this urbanisation of the village bala parties. And more precisely: this very cassette. For it is the first cassette in which Molobaly used a drumkit. As I have written before, it took me some time to get used to the drumkit. But I can see now that this opened the way to a completely new 'use' of this - essentially traditional - music. To give you a better idea of the "Balani show" phenomenon I advise you to watch this very interesting video (in french, - but if you're interested I'll translate it). Unfortunately it appears that the "Balani show" has taken, like the "Sabarni" before, a turn for the worse. First there were rumours of nightly disturbances and a first call to ban the parties. Then came reports of weapons and people being killed. More recently the calls to ban the parties seem to have grown louder, so it may be just a matter of time before we see the end of the "Balani show". At least, in Bamako. In the villages there always be bala parties. And in the city....maybe they will continue, but just for children. Here is Molobaly Keita's third cassette. It features amongst others the track "Signana Tolo" of which I have posted a video earlier. The sabar parties in Dakar could become pretty raucous--especially among the kids! Thanks for another great post. Looking forward to hearing the rest of his cassettes. ...I have already posted two cassette (here and here). @Kopie: I have fixed the link. Thanks! I like a lot this Molobaly cassette singing songs from the repertoire of the Donsongoni hunters but reinterpreted the at style of the Balafolola dancers. I'm intrigued by the comparison to Kuduro in the video. The tape is just great, and it's only a little hop from the relaxed style of Keita to the bala-led version at the beginning (and end) of the video - which is also great, though the drums take rather more getting used to. But it's a rather bigger jump to the pounding electronics & amps, but little balafon that I could hear, of the Balani-Show. Good to understand the progression; but apart from being an urban form developed from traditional roots I struggle to hear much similarity with kuduro! Nevertheless, I am enjoying Molobali more and more! Vols 4 & 5 still to go - and I read you have vols 6, 7, 8 as well. May we still hope for them one day?! @ David: I agree with you completely. There is in my opinion a world of difference between the urban/worldly/stressed sounds of kuduro and the music of Molobaly. And I sincerely hope this stays that way.